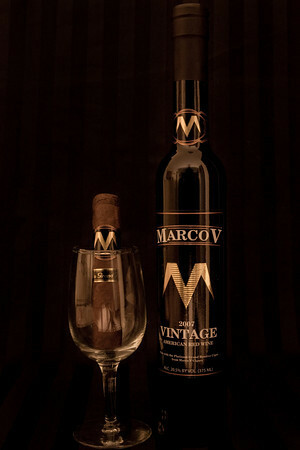 In March of 2010, Marco V Cigars officially launched the Marco V Vintage Port 2007. The Marco V Vintage Port is a premium port style wine specifically designed to be paired with the Marco V Platinum Grand Reserve Cigar. The goal was to enhance the cigar smoking experience by providing the perfect beverage while indulging in your favorite cigar. Our Port is made at the Chateau St. Croix, which is an incredible European Stlye Winery that blends grapes from the best growing regions around the world. The Marco V Vintage 2007 is sampled daily at the winery. Last March, we bottled our inagural 200 bottle batch which sold out quickly. Since then, we have done more micro batch bottlings and have recently prepared 1000 bottles for the Spring. Like our Cigars, this Port is made in small batches to ensure the highest quality wine. The Marco V Vintage Port has a nutty aroma, hints of cedar, sweet tobacco, clean oak, and a lot of spice. The Marco V Vintage Port 2007 was recently picked up by Southern Distributors which is one of the biggest premium wine distributors in the nation. Our Port is now distributed nationally. We hope you get a chance to try this Port and our Cigars and find value in our premium products.